As I sit here ready to post this, it's literally pouring down rain by the bucket-full. There is nothing prosaic or pretty about this kind of rain...the kind of rain which was preceded by booming rounds of thunder and electric flashes of silvery tendrils of lightning. Normally I love a wicked-good thunderstorm; the kind that sets the imagination ablaze with tales of shipwrecked mariners coming to rest upon the rocks buffeting ancient lighthouses, or ghastly stories of the ghosts of long dead New Englanders. However this kind of rain? The kind of rain that beats my shy little flowers into submission, drowns the newly planted seedlings and makes my cats howl with utter contempt at all that slippery wetness preventing them from running around outdoors as if their tails were alight? I don't like it at all. The thunder has passed and the lightning has all but burnt out into the drowning torrents of rain. And now there is but rain. A lot of rain. Yesterday? Not so much, although we were told to expect it. Most of us along the coast of the New England seaboard were breathing a collective sigh of relief that our coastal areas and adjacent wetlands were not going to be in the direct path of Hurricane Bill after all. It seems Bill decided to pass up blue crabs from the warm waters of the Chesapeake Bay and lobster from New England's deep indigo depths in search of other playgrounds to harass. At least avoiding a direct hit gives the asylum here a brief reprieve in order to stock up on things like candles, batteries and a stockpile of Valium which will come in handy - if not during hurricane season then the subsequent Nor'easter season which will be upon us soon enough. Two teenagers, a toddler and four cats, mixed with no electricity is enough to drive anyone over the edge. Heck, even on a good day, when we have all the trappings of modern life, it's enough to drive me insane. So what did we do yesterday in light of not-impending-doom? We took a drive down to York Beach and Nubble Light to watch the breakers roll in and catch a glimpse of the massive surf that had been predicted for the Maine coast. I just wish I'd read the bit about the "dense fog as thick as clam chowdah" in the weather blurb. It made the drive around the twisty bits of Shore Road and the 1A in York, interesting. Once we hit Nubble Light, the fog cleared a bit and I was able to snap off a few halfway decent shots. When my love of photography started to morph into something other than just a fun hobby, one of the goals I set for myself was to capture the essence of breaking waves on the shore. So far I haven't been able to, or even come close. Yet there's just something about the way the waves crash against the rocks and how the white caps slam into jetty that always takes my breath away. The sight, sound, and the smell of the ocean enlivens my senses and fills my soul with joy. There is something about the sea that renews me when I am weak and reminds me that simple yet amazing beauty abounds in the state I call home. I don't think I could ever live in a place that wasn't bordered by the ocean. I feel a deep connection to the waters that border this land; a bond I have a hard time articulating. The inky water which caresses our shores is just one of the many aspects of life along the coast that moves and inspires me. One of my favorite flowers is the sea rose. It's so very beautiful, delicate and soft yet must be resilient in order to stand up to the constant salty sea-spray, the winds that wrap their arms about the shore and the pelting of sand. The sea rose is sort of an allegory for the kind of woman I long to be. 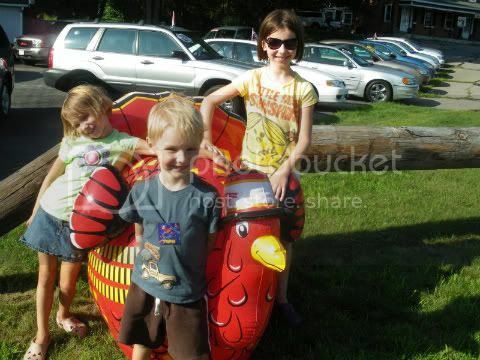 Of course, the most beautiful things seen a long the shore yesterday were two of the jewels in my crown...my kids. Ever patient and always willing to let me click away at a moments notice. More of life's absurdities and observations of life along the Maine coast from Audrey can be found at Barking Mad! I'm pretty certain this story could only happen in a small town. 3:06 p.m. - Caller reported an injured wild turkey at the Highland Plaza, Robert Drive. Animal Control Officer responded, reported turkey was now sun-bathing in a bush does not look injured. Ahhh, yes, that had to be Freddy. 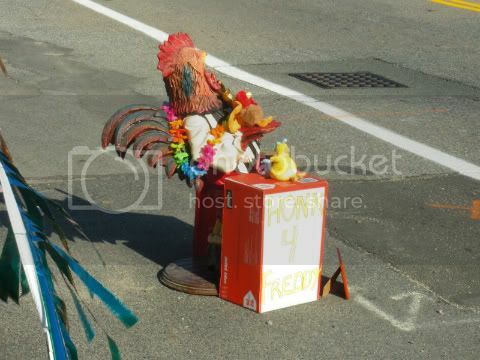 Freddy the turkey didn't just live near the intersection. He walked into traffic, playing chicken-- so to speak-- with the cars that screeched to a halt to let him pass. He pecked at the door of a local church, visited our nearby Target and even strolled the aisles of the dollar store. But, his thing was motorcycles. 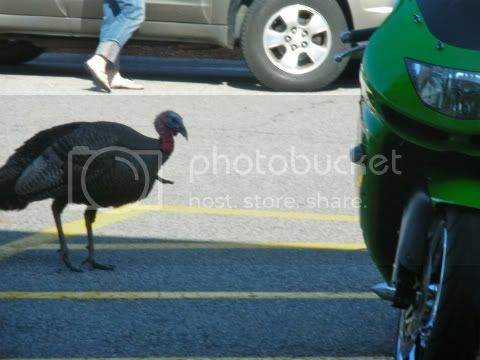 Unfortunately motorcycles don't really want to be chased by a turkey as they try to drive down the street. So, let's just say that after one-too-many complaints about Freddy, he met with a bullet to the gullet from our local police. I won't use this space to rant about how I feel about this decision (I don't like it), but I understand that a well-known turkey causing a major crash in a busy intersection spells l-a-w-s-u-i-t in this day and age. But, really, was it the best, and only, option? I think not. But, what has been hilariously heartwarming is the outpouring of love for Freddy since news of his death started traveling around town. The Five Corners Turkey Facebook page has over 1,500 fans. There have been news reports on radio and TV. A local used-car dealer has even set up a makeshift memorial, which we visited today. Cars honked constantly while we were there. And, I suppose that was fitting for the turkey who liked to walk into traffic.